George Graham reviews The Currys' "This Side of the Glass"
Family bands are a long-running tradition in several genres, from early rock & roll to country to bluegrass. But having members of a group who grew up with each other can perhaps have the biggest payoff in folky music that relies on vocal harmonies. And this week, we have the latest album by such a family band who excel in the kind of vocal harmonies that arise with a combination of genetics and proximity in upbringing. It’s by the Currys, and it’s their third release called This Side of the Glass. The Currys are two brothers, Jimmy and Tommy Curry, and their cousin Galen Curry. The siblings grew up in Florida, while Galen was from Upstate New York, but they frequently got together for family reunions in the Florida panhandle, and made music together when they could. The trio started out rather casually, playing some venues like oyster bars, but after college, they all moved to Charlottesville, Virginia, and concentrated more on their music, touring around where they could, driving their van across the country, and also landing gigs in Ireland. In 2014, the released their debut album Follow, in which the trio emerged folly formed with a first-rate recording that we gave the Graham Award to as the best of that year, for their almost-uncanny vocal harmonies, and great melodic songwriting. Their touring brought them to our region and they put in a couple of appearances on our Homegrown Music series here at WVIA, so by way of full disclosure, this review is written from the standpoint of friend and fan of the band. In 2016, the Currys followed up with their second release West of Here, which continued their appealing sound, with some more acoustic songs on the record. While they had a band on their first album, they primarily toured as an acoustic trio. 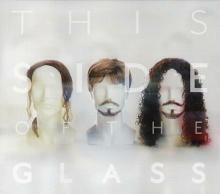 Now they are out with This Side of the Glass, and it’s a continuing evolution of the band’s sound. While the trio’s vocal harmonies remain central to their sound, this is more of a band record and one that features more sophisticated arrangements and production, though it’s still many miles from commercial pop. This time, they worked with a different co-producer than their previous two albums, Sam Whedon, who was also a multi-instrumentalist on the new record. The Currys are joined by their regular drummer Sebastian Green, and there are more prominent keyboards on this album as played by at different times by Daniel Clarke and Charles Arthur. Their songs lyrically run along some of the same timeless topics of their previous records, but this album features a tribute to their home area along the Florida Gulf Coast. They write in their album notes that their hometown, Fort St. Joe, and the surrounding area was badly damaged by Hurricane Michael, as they were finishing up the album mixes in October. Since then, the band has been raising money for hurricane recovery. But the album also contains some more light-hearted songs. This Side of the Glass, the third release by the two-brothers and cousin band The Currys, is probably their best yet. The trio maintain the focus on their impressive family vocal harmonies, while expanding their style range on the new album: from acoustic to more electric, with more elaborate, yet still tasteful arrangements, and lyrics that range from the sentimental and melancholy to the more playful. Our grade for sound quality is an A-Minus, with the Currys’ vocals sounding warm and blending well, and the instrumental sound providing a wider pallet of sonic colors than their previous releases, but still keeping it fairly intimate sounding, and mostly free from studio tricks. This is a good time for people who like folky vocals harmonies. On this series we have featured recent albums by Darlingside, and I’m With Her. The charismatic harmonies that come from The Currys’ family ties add an extra measure and make this another memorable album by one of the best in the field.